The City of Seattle was one of the early pioneers of utilizing green infrastructure as a stormwater best management practice with projects primarily concentrated on reducing stormwater flows in various creek basins. 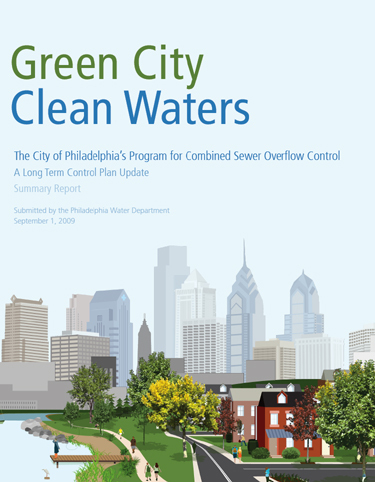 Over the last few years, the City has turned its attention to using green infrastructure for controlling Combined Sewer Overflows (CSOs) within the city. While there is currently no consent decree, the City has established a control target of one untreated overflow per outfall per year for CSO discharged based on a 5-year rolling average (Washington Administrative Code (WAC) 173-245). The highest priority for these efforts has been overflows within Lake Washington. Green infrastructure practices are estimated to contribute to this target by controlling 12% of the 16 million gallons needed to be addressed to achieve the City’s goal. The remaining portion will be controlled by conventional grey infrastructure strategies. The Ballard Roadside Rain Gardens was the first green infrastructure project designed specifically for controlling CSOs. 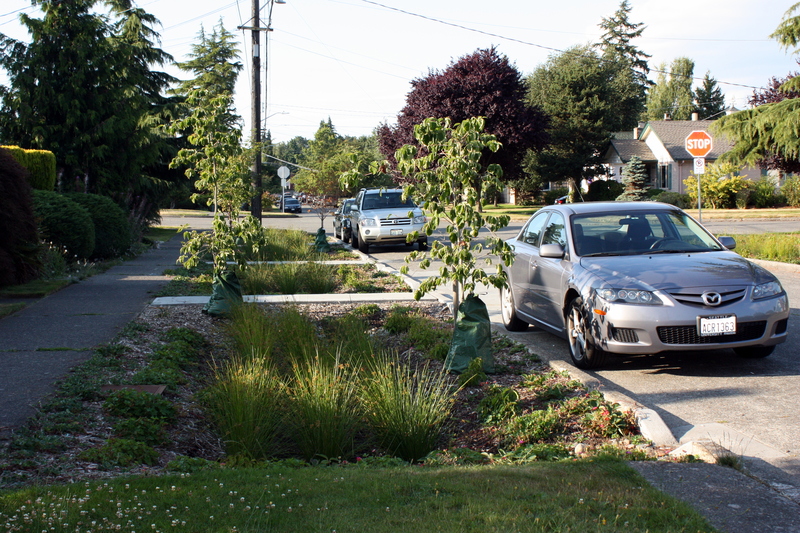 The $1.4 million pilot project was funded by an American Reinvestment and Recovery Act (ARRA) loan and involved installing a series of rain gardens in the right-of-way along eight blocks in the Ballard neighborhood. The rain gardens were installed in December of 2010 and with the expectation that they would reduce discharge volumes by 59,000 gallons or 1% of the the total within the specic NPDES basin. Unfortunately, many of these rain gardens did not perform as anticipated. As a result, over the last few months the project has received negative press and vocal neighborhood opposition over their performance. The City conducted an extensive post-construction analysis, and determined a third of the rain gardens were not draining and another third were underperforming. The main shortcoming identified was that the geotechnical analysis conducted prior to construction was not specific to each rain garden location and therefore could not account for subtle changes in their infiltration rates. As a result, the underperforming rain gardens did not have sufficient infiltration rates to drain within twenty-four hours and underdrains were not used. After the post-construction evaluation and a comprehensive community outreach effort, the City took corrective action. The public’s main issues included the dangers of standing water (i.e. drowning, mosquito habitat, smell), steep side slopes of the rain gardens, and their overall aesthetics. The corrective action included removing several of the rain gardens, reducing the depths and steepness of side slopes of others, and adding underdrains where they were effective. These changes resulted in reducing the original estimated CSO volume control by 36%. Utilize several communication media to disseminate information and get feedback. Develop a Project Management Plan (PMP) that outlines roles and responsibilities, schedule, budget, and risks that is approved by management. Integrate geotechnical engineers into all phases of the project and empower them to speak up. If the corrected (design) infiltration rate is between 0.25 and 0.5 inches per hour, build a redundant system into the design, such as an underdrain. Provide the design for the flow control/bypass plan and erosion and sediment control plan. Do not leave it to the contractor. Review project design, how it functions, and the critical project components with Construction Management ahead of time. Balance funding sources with the ability to course correct during construction and the documentation requirements. Involve geotechnical engineers in construction to field verify that the excavated or exposed soil look as anticipated. Maintain an open dialogue between contractor, construction management, project manager, designer, and geotechincial engineer. The City of Seattle should be commended for recognizing the shortcomings of the project and taking quick corrective action. The project serves as a reminder of how important the success of pilot projects are to the future of green infrastructure not only locally but also nationally. News travels fast and high profile failures can cast doubt on the effectiveness of these types of systems and fuel future opposition to projects. When approaching any green infrastructure project, the details and execution are crucial to a project’s success, but when the project is intended to set the standard and introduce the public to green infrastructure practices, it becomes even more critical. 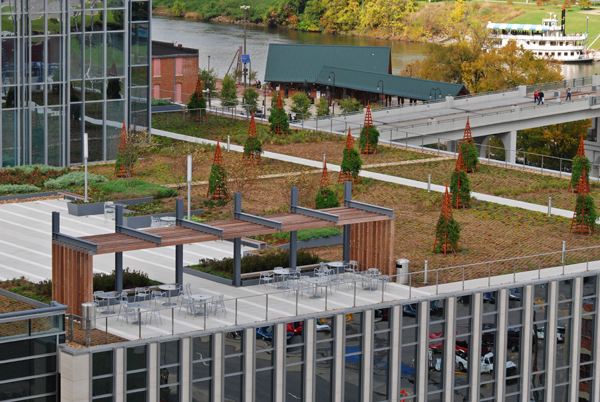 The American Society of Landscape Architects recently released 479 Green Infrastructure Case Studies. The case studies provide an informative snapshot of the type of green infrastructures are being implemented across the country. We are excited the two projects we submitted (The Pinnacle at Symphony Place green roof and Deaderick Green Street) were included in the list. You can check out the entire list here. Steven Peck, Hon. ASLA, and Founder and President of Green Roofs for Healthy Cities was recently interviewed by The DIRT while in Washington D.C. for the Living Architecture Symposium, (“Despite the Economy, Green Roofs Bloom“). In the interview, Mr. Peck quoted a recent survey of the green roof industry which reported that 8-9 million square feet of green roofs were built last year. This figure represented a 30% increase in market growth. Most of this expansion was focused in cities that have public policies in place that encourage and support green roof installation. The most intriguing statements in the article are those that helped quantify the economic impact of green roofs. I did not include the marketing figures in the table above, due the complexity of their findings. Tree planting along a street in front of a property increase the property’s value by up to 9% Source: Determinants of Neighborhood Transformations in Philadelphia-Identification and Analysis: The New Kensington Pilot Study (2004) prepared by The Wharton School at the University of Pennsylvania. Homes adjacent to public parks have about a 20% higher property value than similar homes distant from parks, Source: The Impact of Parks on Property Values: Empirical Evidence from the Past two Decades in the United States (2005) by J. Crompton. Average properties abutting typical community gardens increased in value by 7.4% within five years. 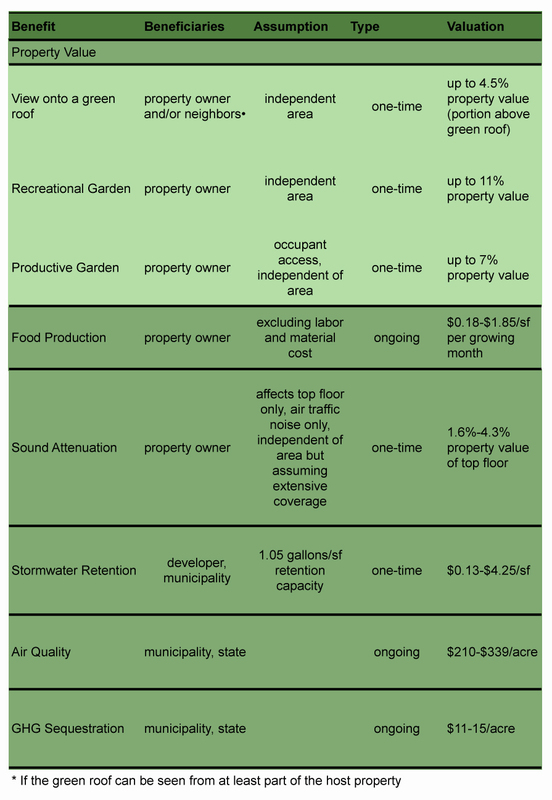 Source : The Effects of Community Gardens on Neighboring Property Values (2008) by Voicu, I. & Been. Supply and demand play a critical role in determining one values and this is not any different for green infrastructure. For urban areas that may incorporate little to no green infrastructure (i.e. parks, green roofs, street trees) and are predominantly unsightly parking lots and roofs, projects that include green roofs should be more valuable and those properties surrounding it should benefit in some way as well. The report provides a great starting point for financially quantifying the soft benefits of green roofs. Over time, data specific to green roofs will eventually become available and we will be able to more accurately quantify their specific benefits. 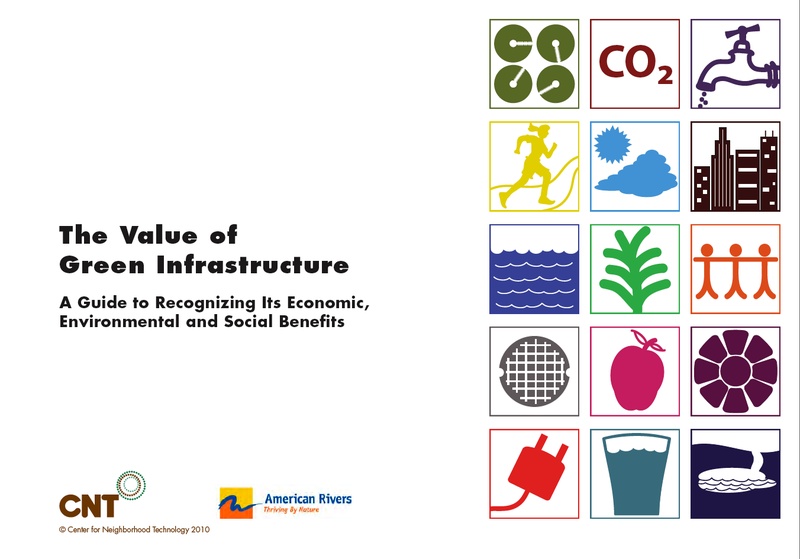 Earlier this year the Center for Neighborhood Technology (CNT) released the publication “ The Value of Green Infrastructure: A Guide to Recognizing Its Economic, Environmental and Social Benefits”. The publication is a great summary of the benefits of Green Infrastructure and goes a step further by providing data to help communities quantify many of its benefits. The document includes two example demonstration projects. The first is for a green roof project on a single site and the other seeks to illustrate the benefits of the green roof site if expanded to a neighborhood scale. The authors point out that full life-cycle analysis was not a part of the scope of the analysis included in these demonstrations. In addition, they offer a series of considerations and limitations of the data included. These points are helpful to consider when applying the information within the report. These include considering the full life-cycle analysis, local performance and level of benefits realized, spatial scaling and thresholds, temporal considerations and scale discounting, operation and maintenance, price variability, and double counting. 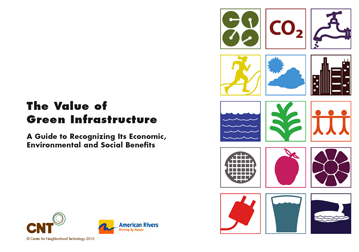 Overall the report is a helpful resource in quantifying the benefits of green infrastructure. The additional external links and resources provide additional tools and are worth exploring. You can find the full report on CNT’s website. Last week, the Economist in an articled titled “Trees grow in Brooklyn” reported on U.S. cities implementing green infrastructure strategies to address the pollution of their waterways from storm water runoff. The article focused primarily on New York City and Philadelphia. According to the article nearly 27 billion gallons of untreated water overflows into the New York harbor each year. 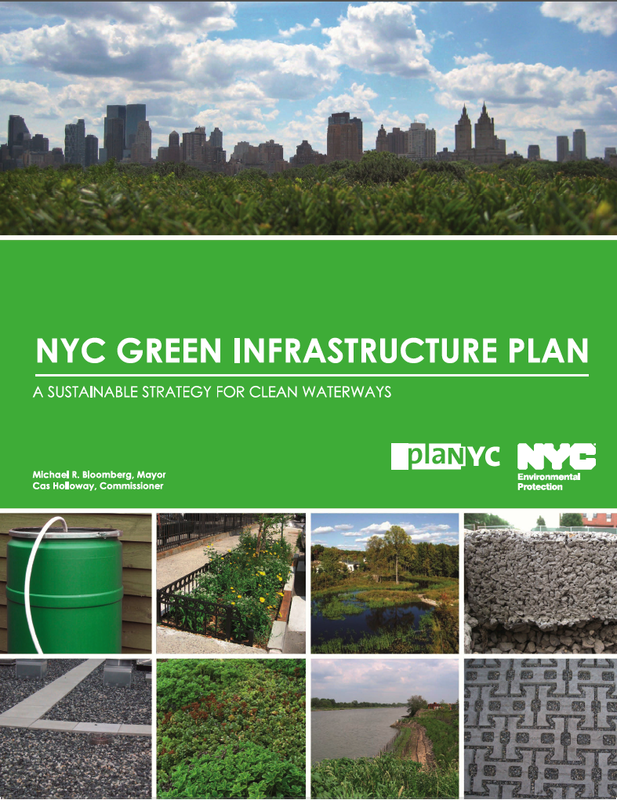 NYC’s recently released green infrastructure plan seeks to address run-off from 10% of the impervious surfaces in the City with green infrastructure storm water strategies that range from rain barrels to pervious pavements to green roofs. The plan estimates that on average the cost per gallon of Combined Sewer Overflow (CSO) avoided ranges between $1 to $2 per gallon. In addition, the City calculates that over a twenty-year period, it will receive between $139 million and $418 million in additional triple-bottom line benefits (i.e. energy savings, increase in property values, health) from the green infrastructure. While NYC’s strategy is also employing grey infrastructure, they see the combination of the two costing less than a grey only approach. The cost of the green-grey strategy is approximately $5.3 billion of which $2.4 billion makes up the cost of the green infrastructure. This is $1.5 billion less than the grey only solution. Chris Strickland, a deputy commissioner with the New York’s Department of Environmental Protection sums it up in the article saying that this (green infrastructure plan) is a way of achieving more than one thing with tax dollars. I recently came across this video covering Philadelphia’s Green Infrastructure Efforts. It was created by GreenTreks, an award-winning Philadelphia-based non profit communications organization dedicated to educating people about the interconnectedness of environmental, societal, economic, and individual health. For more information and links to other resources on Philadelphia’s triple bottom line green infrastructure strategy see our past post Triple Bottom Line of Green Infrastructure.